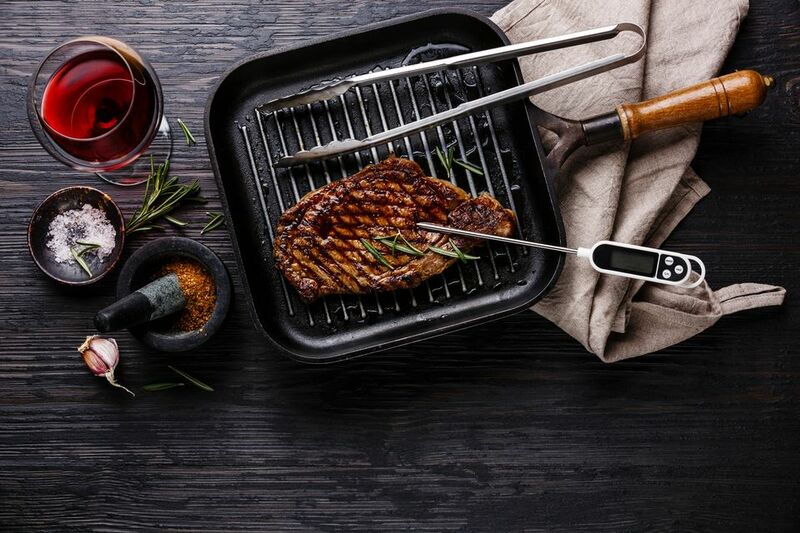 This thermometer has two probes and a wireless range of up to 300 feet, so you can wander far from the grill while still monitoring the steaks and chops. This includes a base unit and wireless remote, so you won’t need to add an app to your phone. The large LCD displays on the base and remote are backlit so you’ll be able to read them in low light conditions. This has presets for nine types of meats using USDA recommendations, and all of the presets can be reset to your preferences, which are saved when the unit is turned off. This also has a timer function. The timer can be set for two different functions, either a maximum of 99 minutes, 59 seconds, or 99 hours, 59 minutes, for longer cooking sessions. The probe wires are rated to 716 degrees, but if your probe fails, the company will replace it at no charge. The thermometer can read from 32 to 572 degrees. This thermometer has presets for eight different types of meat, and up to four different temperatures for each, or you can set you own custom temperature. It also has a timer function for up to 99 minutes. The probes are heat resistant to 482 degrees, and can read from 32 to 482 degrees. The bright blue backlight makes it easy to read in any light condition, and the loud alarm notifies you when the food is done. The wireless range is 65 feet, and the wireless unit has a belt clip to make it easy to carry. This thermometer can only read one probe at a time; the second probe is included as a spare. This thermometer connects to your phone via Bluetooth and has a range of about 100 feet indoors and 170 outdoors, depending on interference. It has 11 preset temperatures for different meats based on USDA recommendations, or you can manually set your preferred temperature. It also has a timer feature. When time is up or the cooking temperature has been reached, the app will beep and flash to alert you. This comes with four probes, and you can add two more to monitor up to six different meats, or use one probe to monitor the grill or oven temperature while the rest monitor the food. This reads from 32 to 572 degrees, and the wire is designed to withstand temperatures up to 716 degrees, while the silicone handle can withstand up to 482 degrees. The base unit has a magnet back, so you can attach it to a convenient metal surface. This thermometer has a range of 300 feet, and has a loss-of-signal alert if you go out of range for more than a minute, so you won’t accidentally place that lawn chair a little too far from the grill and overcook the roast. This has two probes that are rated for 716 degrees, and the unit has preset temperature for nine common meats and nine game meats, so you won’t have to look up proper cooking temperatures for your elk or boar. You can also customize the presets for your personal taste, and the customized temperatures remain even when the thermometer is turned off. The probes can be used to measure either meat temperatures or grill temperatures. Two grill clips are included to conveniently attach the probes to the grill, and the remote has a backlight, so it’s easy to read in all light conditions. The base and remote are a burgundy color, which makes them easy to match if you happen to have other sets of remote thermometers in the drawer. This Bluetooth thermometer connects to your phone with an indoor range of 100 feet, and an outdoor range of 200 feet. If you wander outside the range, you’ll get a push notification on your phone, so you won’t accidentally go too far from the grill or oven. This has two probes to monitor two foods at the same time, and the app will alert you when the proper temperature has been reached. You can use the included preset cooking temperatures, or set your own. The base unit has a backlit LCD so you can read it in any light, and the display cycles between the two temperatures being monitored. The probes can withstand up to 482 degrees, and the cables can withstand up to 716 degrees. This comes with two food probes and one oven probe with a clip, and can monitor two temperatures at a time, whether you choose two foods, or food and oven. It also has a timer function for up to 9 hours, 59 minutes, 59 seconds. This has a range of up to 230 feet. The thermometer can read from -4 to 572 degrees and has eight pre-programmed temperatures for different meats, with up to five doneness levels for each meat. You can also adjust the temperature to your desired doneness. Our reviewers spent five hours testing one of the most popular wireless grill thermometers on the market. To get the most comprehensive feedback possible, our testers used this thermometer while monitoring steaks, chicken, and more. We asked them to consider the most important features when using this thermometer, from design to ease of use. We’ve outlined them here so that you, too, know what to look for when shopping. Dedicated remote vs. app Wireless thermometers can operate through a dedicated remote or an app that you install on your phone. Each has its pros and cons. Having an app means you won’t have that extra device to keep track of, but it’s important to make sure your phone is compatible with the app. Alarms What alarms do you want to set? Do you only care about the highest temperature reached (to make sure the food is cooked), or do you want to monitor a falling temperature, too? Some thermometers also have alerts and timers. Run through different cooking scenarios before buying. Temperature range If you’re going to be checking only if your meat is cooked through, there’s a fairly narrow range of temperatures required. However, once you’ve got a remote thermometer, you might find that you want to check other temperatures like the interior of your cooler, oven, or grill. “This thermometer makes me feels like I can grill anything,” raved one of our testers. Why? “The basics are so simple and trustworthy,” she continued. “I also love that there are cooking settings for all different proteins.” One of our reviewers also loved how versatile it was. “It was a nice surprise when I was able to use it for kombucha,” she noted. “That just shows how much this product can do, which makes it worth the money.” However, our testers thought its design was clunky: “I need two hands to carry these things around — which you don't always have when you’re grilling or having a cookout,” one noted.